This is one of the easiest pan-fried prawn/shrimp recipes that is remarkably delicious.Well seasoned prawns/shrimp are fried with onions then tossed with more fresh onion and jalapenos.The result is sweet,juicy,garlicky,and slightly spicy.Yum!It’s all time favorite in my family. chili powder or chili flakes to add more heat. In a large bowl,combine prawns/shrimp,salt,pepper,onion powder,garlic powder,(optional;chili powder or flakes,old bay seasoning. )1/2 of sliced onion,1/2 of sliced jalapenos and corn starch.Set a side. In a another bowl, combine the rest of the onion and jalapeno. Or scallions with jalapeno or even both. Heat a wok or frying pan on high heat.Add oil and let it heat up.When the oil is really hot,fry prawns in batches on both sides. (about 3-4 batches). 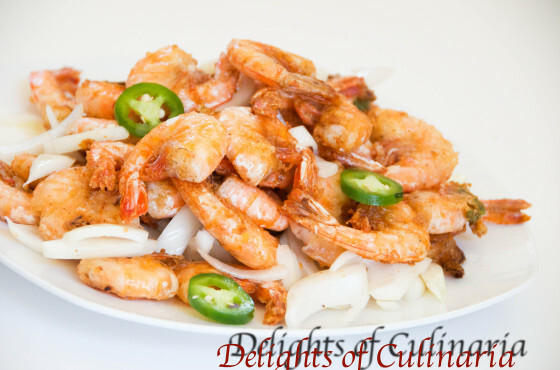 Place fried batch of prawns in to the bowl with onion and jalapeno and mix. Mix prawns every time when adding another batch. Hey Nadia I was wondering where you bought the prawns? and do you serve this dish with rice? Hi Alana,I buy them at whole foods. They have a 2lb bag in the freezer dept for like $20.You can serve them with rice or fried rice, but we eat them just by itself.It requires peeling the shells, but you can also use the shell-off kind of shrimp too.I think these kind will go more with rice. This is not the “saucy” type of dish. Thanks Nadia!! do you by any chance have Chinese inspired kebabs? more of Chinese flavor such as teriyaki? Not exactly kebabs,but I marinade whole skinless boneless chicken thighs with teriyaki sauce (from trader joes).Kikkoman one will work too. then add some soy sauce,salt and peppper(lots). you can try cutting it in pieces, then sprinkle with sesame seed. although I never tried it in pieces. Sesame seeds on already grilled. Sorry Alanait took me a while to respond.About tomatoes and pickles…honestly I never done them on my own. My mom always makes them. We always used to help her when I was living with her before I got married.But later in the season when she’ll be making them, I’ll get the recipe.but yes, those are yummy!! !